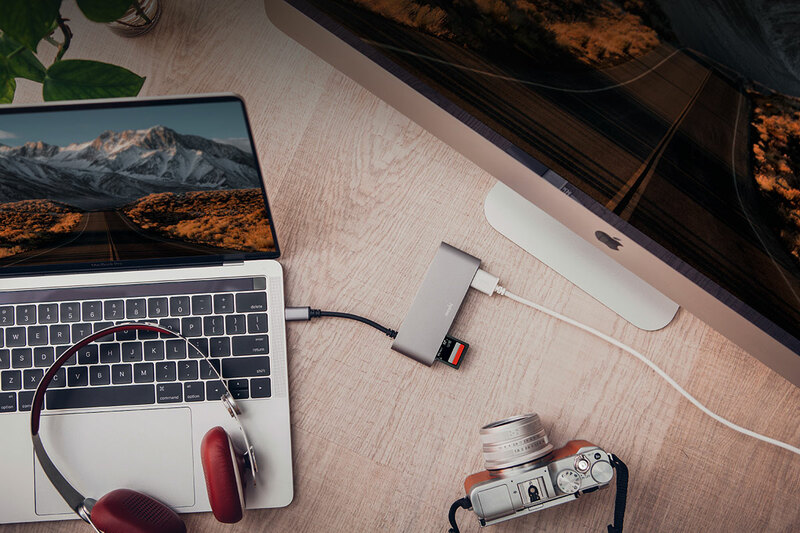 Ideal for photographers and videographers, this adapter brings back the SD card slot back to your MacBook Pro. 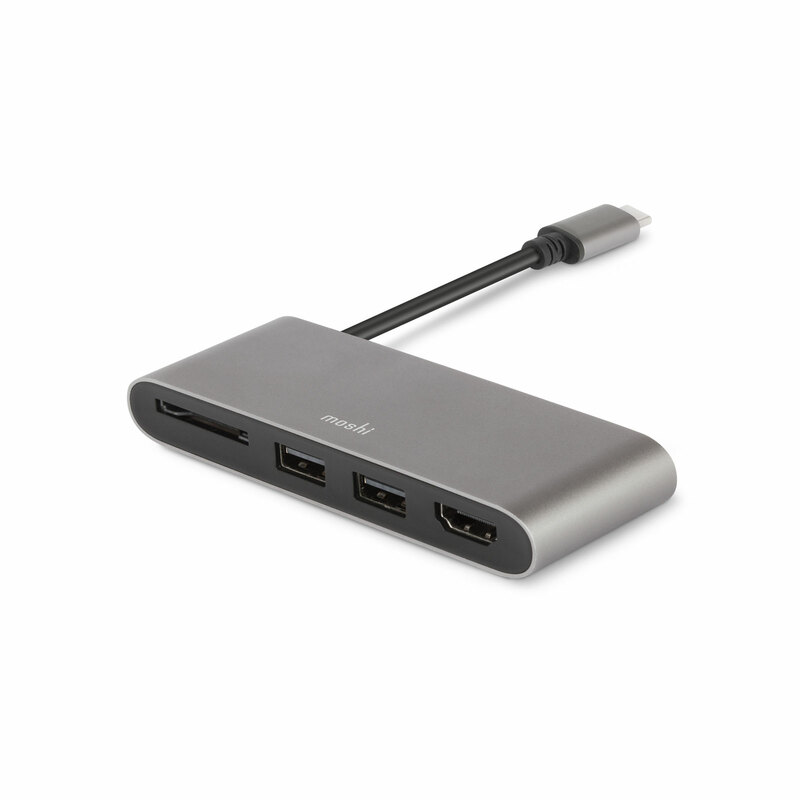 Includes an HDMI port for connecting to an external monitor, and 2 USB-A ports for other peripherals. 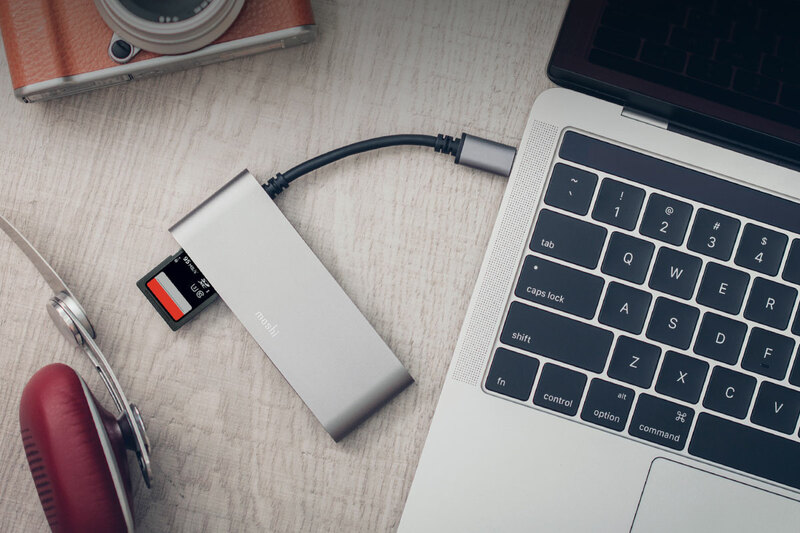 Connect an external HDMI monitor, USB peripherals and transfer photos and videos with a built-in SD card reader. 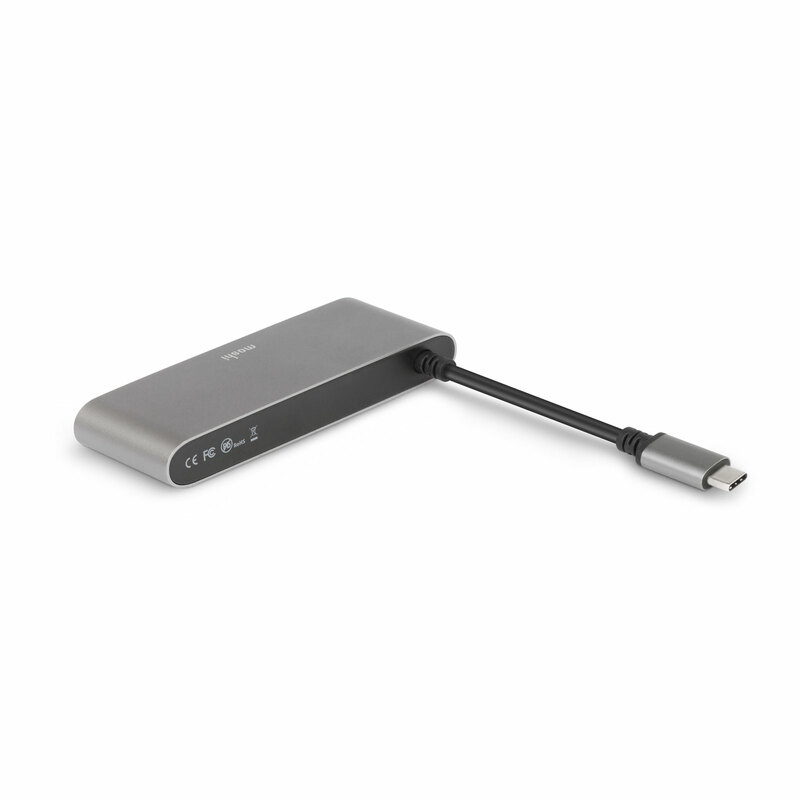 Two USB 3.1 (Gen 1) ports transfer data at speeds up to 5 Gbps and charge any connected devices. 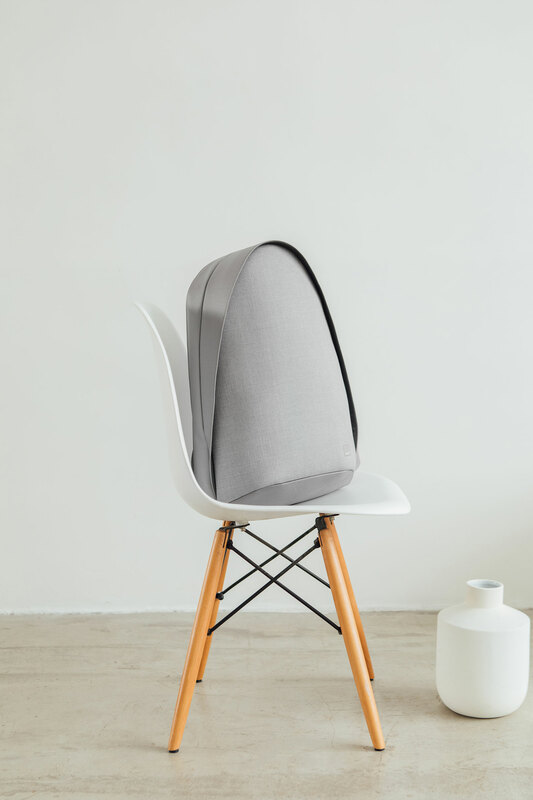 The card reader slot supports both SD and SDHC/XC memory cards with transfer speeds up to 104 Mbps. 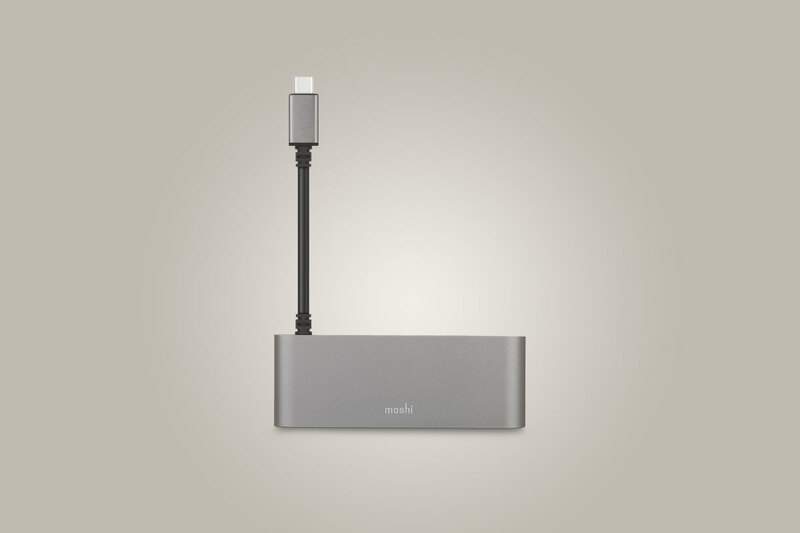 Moshi’s USB-C Multimedia Adapter is encased in premium anodized aluminum. 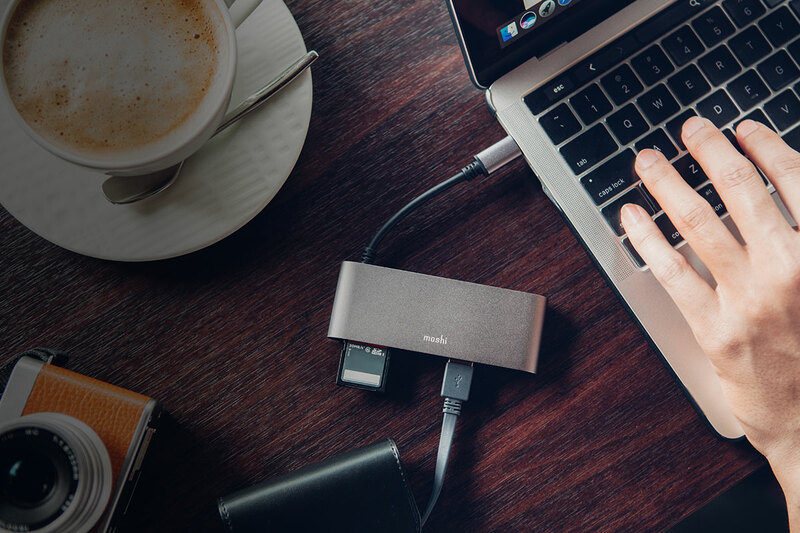 The perfect accessory for digital creatives on the move, Moshi's USB-C Multimedia Adapter brings critical functionality to any USB-C device. 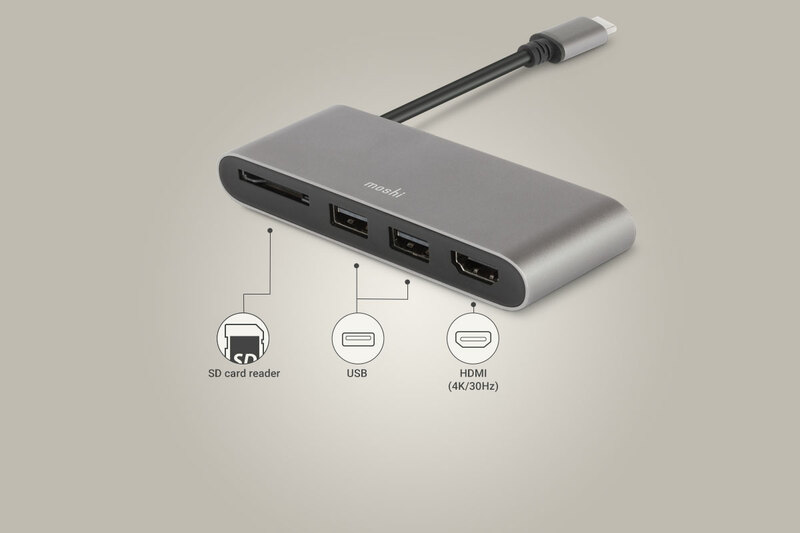 This 3-in-1 adapter features a built-in SD card reader for quickly transferring photos and videos, an HDMI video adapter for connecting to an external display, and a dual-port USB hub for storage backups and other peripherals. The card reader slot supports both SD and SDHC/XC memory cards with transfer speeds up to 104 Mbps. The HDCP-compliant HDMI port outputs 4K UHD video (30 Hz) as well as multi-channel digital audio to supported devices. 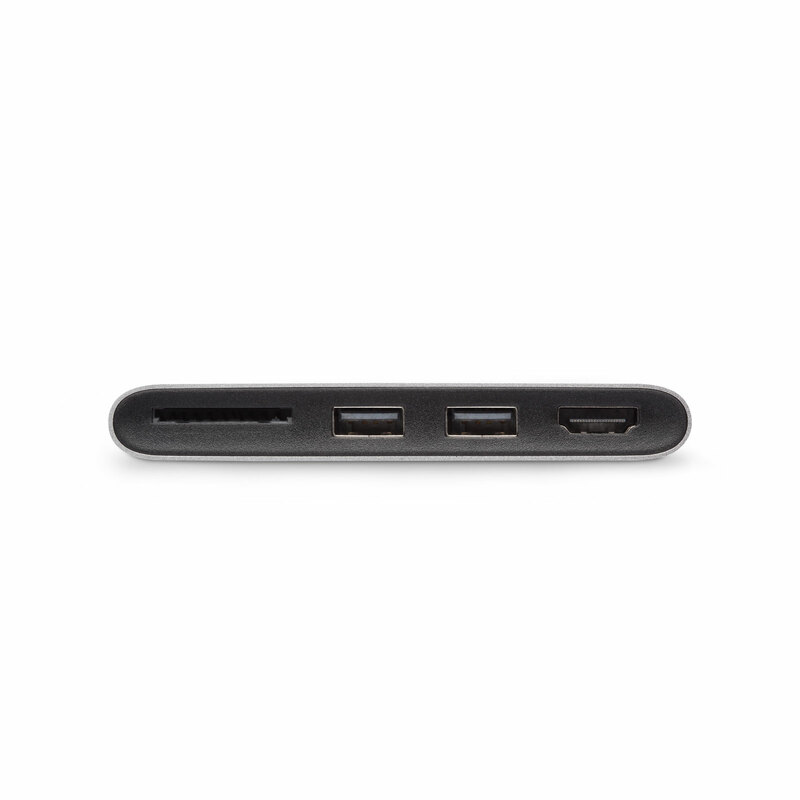 There are also two USB 3.1 (Gen 1) ports that transfer data at speeds up to 5 Gbps and charge any connected devices. 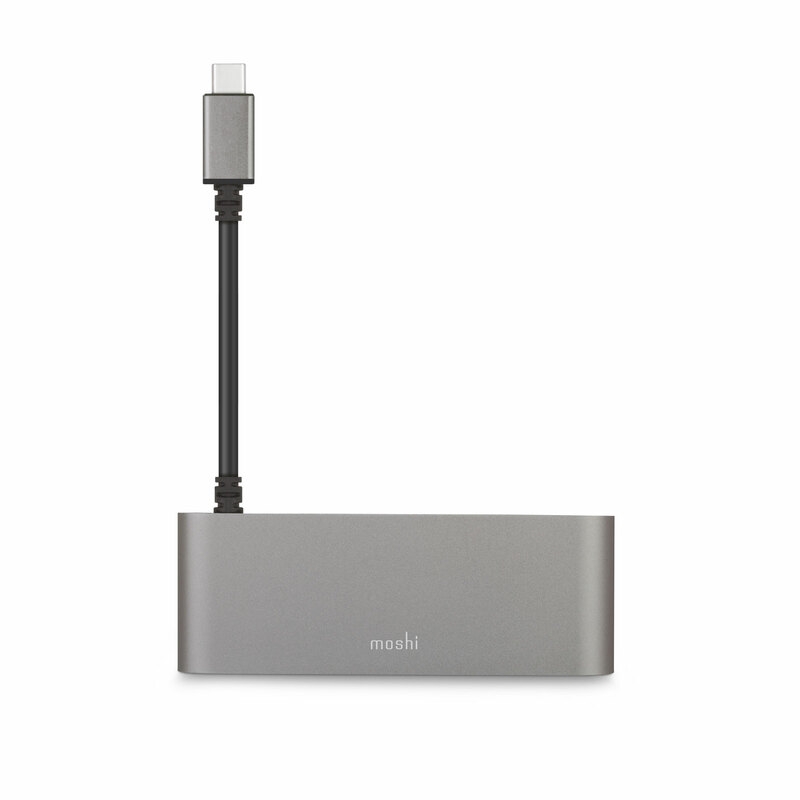 *Apple SuperDrive is not compatible with USB-C Multimedia Adapter. Supports SD, SDHC/XC UHS-I cards with speeds up to 104 Mbps. 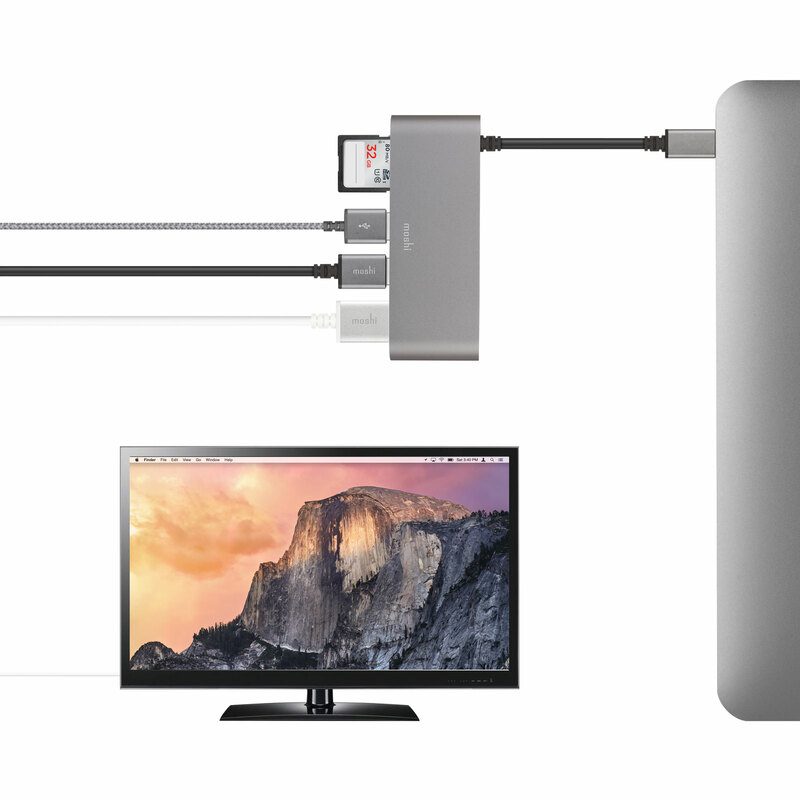 HDCP-compliant HDMI video output: 4K (30 Hz) and FHD 1080p (60 Hz). HDMI multi-channel digital audio output on compatible devices. Premium anodized aluminum casing minimizes EM interference.